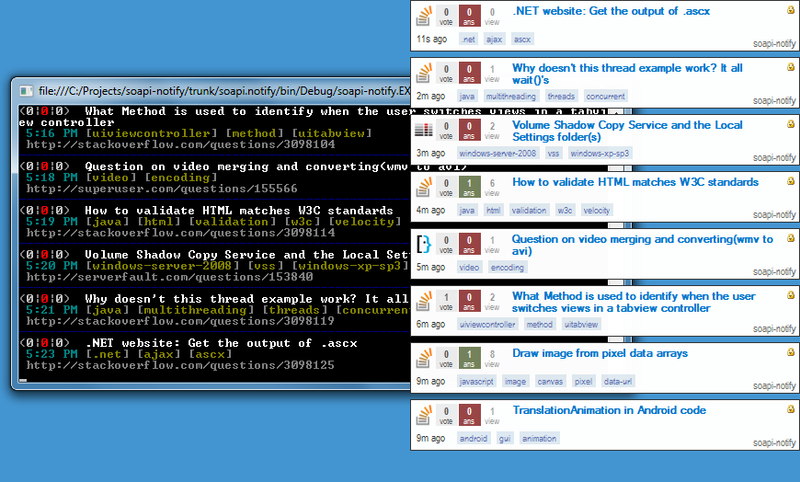 soapi-notify is an easy to use windows application that monitors Stack Exchange sites for new questions. You may filter the questions that are notified by tag. You may choose to see only questions that contain a tag or to see only questions that do not contain a tag. soapi-notify may be minimized to the notification tray area by pressing the space bar. You may optionally receive notification via Growl for Windows. soapi-notify carries it's own custom Growl displays that provide a detailed view of questions in a familiar format. Selective pinning: If you would like to keep a question on-screen, simply click the grey lock icon. It will turn gold and the notification will remain on screen while others time out and fade away. Updating: A pinned question notification will be updated at regular intervals to reflect the current state of the question. Simply place the file in a convenient location and run it from the command line or create a shortcut. To view command line usage, execute soapi-notify -? The inspiration for soapi-info came directly from the perl script SENotify by radius. If you like this app, please also give SENotify an upvote. You may simply run soapi-notify to invoke the GUI configuration or directly from the command line or from a batch file or windows shortcut. --sites, -s=VALUE       Sites to monitor, semi-colon delimited. --tags, -t=VALUE        If specified, only questions containing these tags will be notified. --poll, -p=VALUE        Polling interval in seconds, default to 60 seconds. Minimum value is 60. --update, -u            Update pinned questions. --help, -h, -? Show usage. The configurator can be used to run soapi-notify or as a command-line builder by copying the command line text. To open the question in the default browser, left click the notification. To take advantage of the pin-able and update-able displays you must open growl to the 'application' tab. soapi-info is released under the MIT/X11 open source license. soapi-notify was written in C# in Visual Studio 2008.
fixed odd issue with capturing keys. now single press of spacebar will minimize the app. added link to question. Click notification to open question. Right-Click notification to close. added minimize to tray. press space twice to minimize. These will be incorporated gradually over the next month or so. I need to finish some other projects and get a job. Anyone who wants to help out may submit patches and perhaps be added to the team. part the Third: in which code poet waxes v1. After the unexpected divine intervention of Brian, the developer of Growl for Windows, I was able to refactor the evolving custom pin-able update-able displays into much slimmer and much less complex code. The updates are now batched by the server, soapi-notify, and pushed to the notifications that are still registered for updates. For those that are not quite satisfied with the default displays provided with soapi-notify, the source for the default display is a great place to start writing your own. Be sure to share it here. There are a few more things that I would like to incorporate into V1 before calling it soup. the ability to monitor existing questions. keep an eye on questions as they evolve. extended filtering support. either/or tags using the api methods is a bit limiting. I will use client side filtering to provide a more compelling filter experience. proxy support - need to set up a proxy to test this. part the Second: in which code poet introduces vNext. So, after considering radius' comments I realize that the omission of the vote/answer/view metric was a bad idea, so I redesigned the new notification and console output. Regarding the other half of the dialog in which the possibility of updating notifications has been realized in the self-updating notifications. If a notification times out and closes it self, there is no update. If the notification is 'sticky', either by configuration via Growl or from 'pinning' by clicking the grey lock icon, the notification refreshes itself at as yet to be determined refresh rate. Compare the 'How to validate HTML Matches W3C standards' question in the screen shot: The console output shows the state of the question when it was pulled and the notification has tracked, in real-time, the votes, views and answers over the last 4 minutes. This build is in the source repository right now. 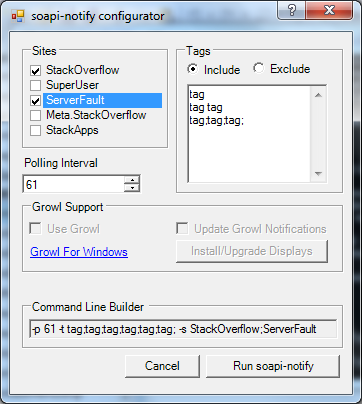 If you are familiar or would like to make yourself familiar with the process of manually adding a growl notification type, knock yourself out. A binary release including self-installation of the display will be released tonight. By popular demand: A GUI. select and copy your 'ignored tags' from the site and paste them into a text box to omit questions containing those posts from being notified. select and copy your 'interesting tags' from the site and paste them into a text box to make questions containing those tags 'sticky' by default along with the appropriate background color visual cue. I whipped up soapi-notify in a few hours. It actually took more time to publish and document than it did to write. After using it for a day I am convinced that the idea is much more than a novelty. I am polling at the recommended 60 second intervals and, funnily enough, I never see a question that is more than a minute old. imagine that. And it brings the point home when I see a stack of questions that are less than 10 seconds old. So, I am convinced that this is a viable app. With that in mind, lets discuss some design issues. It is quite obvious that my soon to be previous screenshots include these metrics in the results and they seemed relevant in that there was non-null data. But this was due to a bug in the time-zone conversion. In reality - as explained previously, the questions that are being reported are seconds old. There are no votes and there are no answers. So I have removed those data points, which makes the output much cleaner. For the console output, which is persistent and linear, I am including a short time string. So, not content with the default behaviour of any of the displays (growl notification boxes) that are available in that I would like to let them fade out as normal but i would also like the ability to 'pin' or make 'sticky' a notification. Kinda like a sticky note. So I created a custom display just for us. Here is the design at full resolution. I am building it so that all notifications are static height, unlike standard Growl displays, to present a more consistent display. They are just a little wider than most displays I have seen, around 400 pixels. If this turns out to be an issue with screen real estate we can revisit this and re-institute a more narrow dynamic height notification. Is there a way to get this to work with other SE sites, e.g. Programmers.SE? soapi-notify: There was an error retrieving results. Another issue: if I lose network connectivity and a poll happens, the app will break, and won't reconnect. If the app is minimized when any error occurs, you won't know about it, because it doesn't send a Growl notification. Sky, you around? Might you make these quick fixes? My only request - please make a GUI! The main settings page - you could also add options like "Start soapi with Windows", etc. Ideally, soapi would start minimized as an icon in the system tray. You can also specify the refresh time, force a check, and add/remove sites to check. Site-specific page - you can add tags on the left to only have soapi retrieve/display questions with those tags, and on the right, you can add tags to be ignored, even if they occur with a favorited tag on the left. Not the answer you're looking for? 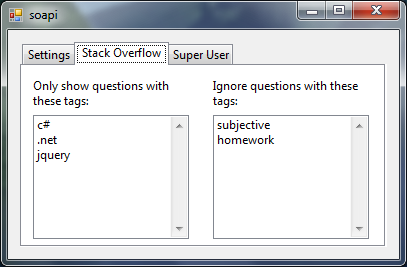 Browse other questions tagged app obsolete notifier .net api-v1 .